Liberal arts are liberating arts. They’re an opportunity to see how multiple disciplines work with each other and challenge each other. If you don’t have a variety of way to look at something, your perspective is limited. When all you know how to do is wield a hammer, everything looks like a nail. The liberal arts and sciences, on the other hand, provide an entire tool kid for understanding an issue. You can apply principles of design, consider the aesthetics of the issue, or use the scientific method to conduct an experiment. You’re able to see connections between the historic, the economic, the political, the artistic. 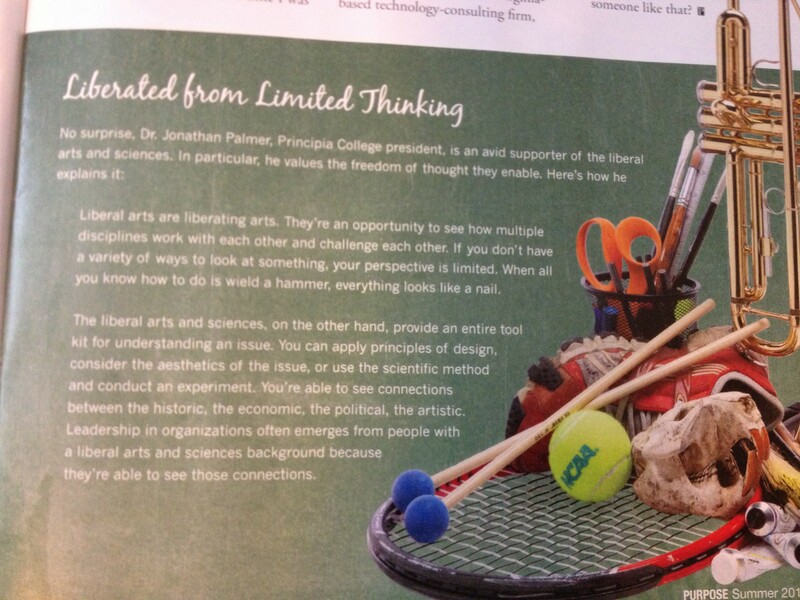 Leadership in organizations often emerges from people with a liberal arts and sciences background because they’re able to see those connections. I agree with Dr. Palmer, being able to see historic, economic, political, and artistic connections is important, events do not occur in a vacuum and being able to place them in a greater context is a useful skill. During my time at Principia I had the opportunity to study The Reformation and 20th century religious philosophies through the lens of moral courage. Of all the influential people we studied, I remember two: Martin Luther, who started the Protestant Reformation, and Dietrich Bonhoeffer, a German theologian who actively opposed Hitler and Nazi regime. Classes which deal with topics like moral courage tend to have a lot of class discussion – dividing into small groups, or as an entire class. These are often led by a fellow student, or the professor moderates and guides asking questions here and there. The problem comes when people can’t separate Christian Science (which is not allowed to be taught in the class room – see footnote 1), with the subject matter at hand. I remember a conversation with my father about separating Christian Science from my academic work, I was struggling with middle school science, why would I ever need to know the parts of a dissected squid? I had learned in Sunday School that the squid wasn’t real, so learning about it was just stupid. My dad told me I had to go to school and learn, and that I should actively separate my Sunday School knowledge (the unreality of it all) from my middle school experience. At school I got very good at putting Christian Science in figurative box on my mental shelf, but in Sunday School there was a bit of cross-over. I read a lot as a child, and often had questions about the finer points of the Old Testament vengeful God, Jesus, the issues of choice, predestination, free will, angels, the hierarchy of Heaven, and other religious dogmas. I was curious how they fit into the construct of Christian Science, and more often than not, we went back to the 10 commandments so I could not further hamper my classmate’s spiritual growth. At Principia, there is often a gray zone between Sunday School and academic classroom time. It is one thing to put Christian Science in a box while studying economics or chemistry, but classes on religion and philosophy, frequently touch on the topic as Christian Science is often the only (or at the very least, dominant) religious and philosophical construct the students are exposed to before they arrive at Principia. I don’t think that would’ve stopped the Catholic church from trying to kill him, nor do I think it would’ve been particularly helpful to Luther’s cause – trying to make the Bible and God accessible to the common man, lightening the tax burden, and changing up a few things in the Catholic Church of the day. Translating the Bible into German so everyone could read it was far more useful than trying to convince the starving masses their situation was “unreal” and they should “take no thought” for where their next meal was going to come from. Bonhoeffer was so close to discovering Christian Science! Bonhoeffer was born in 1906, yes, that was before the final version of Science & Health was published, but it was after the Founding of TMC. By the time Bonhoeffer began theological study at Tubingen University in 1923, CS was a well established movement. Science & Health was translated into German in July of 1912 (2). Bonhoeffer didn’t need to “discover” Christian Science (it had already been “found” by Ms. Eddy), he was probably aware of it’s existence, and I’m sure if he’d wanted to he could have gone that direction with his ideas. Obviously he didn’t. Watching undergrads whose religious and theological background does not extend past the confines of Christian Science Sunday School struggle with graduate level theological material from other Christian denominations is sad. The inability to think beyond the confines of Christian Science “theology” hindered their ability to consider other schools of thought (this was also often the case in philosophy classes, not everything has to relate back to CS). Many of us were unable to put Christian Science in a box on our mental shelves and grapple with the concepts put forth. To be fair I struggled with Luther’s ideas of Justification by Faith as well as some of the ideas on transubstantiation. The Christian Science church does not offer wine and wafers, so Luther’s internal struggle about being worthy to preform such rituals was a little strange. Bonhoeffer also gave me pause to think as his understanding of the nature of God, and the need for Christians to act within the world which is very different from Ms. Eddy who teaches that spirit is the only reality. It is a far cry from Ms. Eddy’s decree to let people “work out their own salvation” and pass “righteous judgement” and then sit smugly by as they suffer. The Christian Scientist is not truly of this world, they are after all, spiritual beings, earth is their preparatory school, and once they have learned their lessons, they shall move on to greater things (I never quite got how this worked). The importance of the liberal arts education is especially clear in these situations. Being able to look at Ms. Eddy, Martin Luther, and Bonhoeffer in their larger historical and political contexts, context beyond their theological views, is vital. They are all very clearly products of their time. Ms. Eddy was so different from Luther and Bonhoeffer who wanted to make change in the here-and-now, focusing on salvation (do CS need to be “saved” I’ve never been clear on that), the role of the church community (CS has no church community just church committees and individual branch churches which exist in “official” capacity at the whim of TMC). Luther and Bonhoeffer were living with the very real possibility of a sudden, unpleasant demise. Ms. Eddy may have made accusations of “mental aggressive suggestion” and “mental malpractice,” but Luther had an angry Pope after him, and Bonhoeffer was actively associated with a Nazi resistance movement. Having watched my fellow undergrads at Principia I am becoming more and more convinced that teaching a wide variety of religious philosophies to children as literature and common culture is vital so that they are at the very least exposed to a plethora of ideas and can be allowed to make their own decisions about what path they choose. It is also important to remember, that not everything must relate in someway back to Christian Science. The Principia clearly recognizes that Christian Science shall not be taught except in the Sunday School classes provided for in the Manual of The Mother Church, The First Church of Christ, Scientist, in Boston, Massachusetts, by Mary Baker Eddy. In obedience to the Church Manual, Christian Science shall not be taught in the classrooms or elsewhere. Each member of the faculty and staff shall strive to demonstrate “the beauty of the music he teaches in order to show the learner the way by practice as well as precept” (Science and Health, p. 26:19-21). It shall be the purpose of The Principia so to conduct its activities as to turn the members of its student body, faculty, and staff to Christian Science at all times, so that all may gain practical experience in utilizing the teachings of Christian Science in daily living. It allows the History of Christian Science to be taught, and occasionally offers such a course. Authorized copies of MBE’s biographies are also often on class reading lists. http://www.longyear.org/news_events/news/103-who_are_the_people_in_this_photograph_from_the_longyear_collection – it is worth noting the Moltke’s son, Helmuth James Graf von Moltke would later go on to be a member of the same resistance movement as Canaris and Bonhoeffer. I was also raised in CS and have just recently split from the church. In doing so, I’m finding that my rather limited upbringing is making navigating this whole world outside of CS bewildering, not only in regards to the medical fields (although I’m practically having to take on mentors to figure out what I should be doing there), but also in regards to different world views. I completely agree that not teaching these other philosophies and religions is doing a huge disservice to everyone who is raised in CS. Thanks for writing this blog. As the only member of my family who has left the church, and with much of my childhood social community still wrapped in it, I often feel like I’m on my own going through this. Like I’m living without a net to fall back on. It’s nice to have a reminder that there are other people out there who have done this before. You are not alone! There are some former-CS groups on facebook which provide some support, you can e-mail me at kat.at.kindism@gmail.com for more information about them. There are also some other former-CS bloggers (http://emergegently.wordpress.com/ & http://mkhuggins.wordpress.com/ both blog regularly see https://kindism.org/csresources for more – there is also the very basic intro to health care https://kindism.org/former-cs-guide-to-health-care). Good job. You certainly provide original thinking. I don’t recall who he was during World War II, but some respected German protested Hitler and was executed. He was brought up in Christian Science and still was when killed. As to teaching in the schools and colleges, twice Mrs. Eddy wrote that someday such teaching should occur. The leaders of the church and the rank and file have ignored these two statements. It’s probably because they have no clue how that can be done; not to mention the issue of the U.S. Constitution that forbids religion being taught. I contend that had Christian Science gone more into its scientific roots, it would be the Science of the Divine Nature that could be taught in public schools. Teaching Science, the religious conflict with the U.S. Constitution could be avoided. However, the church did not pursue its scientific basis and so can’t offer any classes to teach. Why? An overemphasis on healing and on the rules of religion and not some time spent exploring the Science of Christian Science is the reason. You may be thinking of Helmuth von Moltke (http://en.wikipedia.org/wiki/Helmuth_James_Graf_von_Moltke or his father http://en.wikipedia.org/wiki/Helmuth_von_Moltke_the_Elder) von Moltke the Elder helped translate Science & Health. Very interesting post, Kat. Principia’s policy that you quote permits them to teach a class on the History of Christian Science. When I took that class at Prin about 1970 it was a “history” sanitized of any critical historical or scholarly literature on C.S. I believe the course was suspended for some years, and I wonder why. Did the accrediting association have a problem with how it was taught? I believe the course has been re-instated with this academic year, and I am wondering if it is now taught in accordance with accepted scholarly standards for history. If so, they would have to include critical material in the syllabus as well as the “authorized” biographies, etc. Liberal education should let students see the whole picture and form their own conclusions. It is my understanding they can teach the “History of Christian Science” but NOT Christian Science itself (that is reserved for Sunday School and Class Instruction). I know at various times History of CS has been offered, as was a class on MBE’s life, and the First-Year-Experience “People of Courage” had her as one of the three people studied (don’t know who the other two were). I’m not sure what the current status of the”History of Christian Science” course is currently, I think it has been reinstated, but I don’t know for sure.